Today, I’m introducing a new category of post. It’s what I like to call the Extra Dry Martini Hero. An Extra Dry Martini Hero can be a lot of things, including a person living or dead, or a fictional character that exemplifies Extra Dry Martini qualities. They must have smarts, sass, and not be afraid to speak their mind. Above all, he or she must be a true original, often imitated, never equaled. To kick off the series, I’d like to nominate the fictional character Auntie Mame (of the film of the same title) as the inaugural EDM hero. 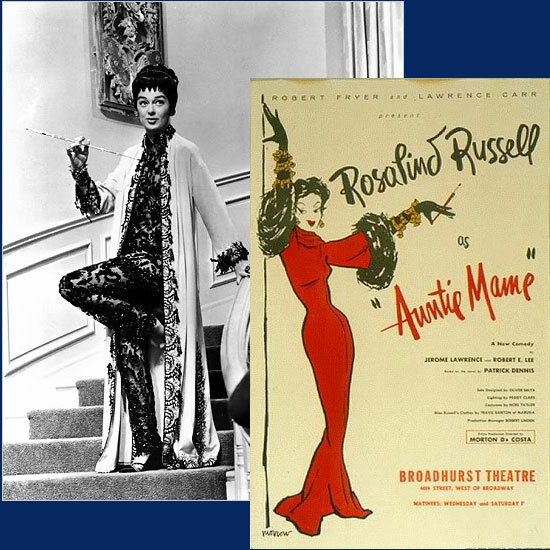 Ever since I was young, I’ve loved Mame, and her spot-on portrayal by the incomparable Rosalind Russell. In later years, I discovered the book that the film is based on (penned by Patrick Dennis), and found it just as enjoyable. Thumbing her nose at convention, Mame gleefully throws a string of outlandish cocktail parties at her Beekman place penthouse, hiring bootleggers during the height of Prohibition, and entertaining foreign dignitaries, famed artists and intellectuals alike. Her most loathsome adversary is always the insufferable snob, and whether it’s Patrick’s stuffy trustee at the Knickerbocker Bank, or his awful, empty-headed (but thankfully short-lived), fiancée Gloria, Mame always outsmarts the people we love to hate, doing it with such cleverness and grace that those who oppose her don’t have the faintest clue they’ve been outfoxed. You nailed it!! I have loved Mame since I first saw the movie when I was but a wee lass. (Not sure why I’m thinking in brogue.) When I was 17 the Community Theatre group in the next town over (think Kansas) held auditions for their production of AUNTIE MAME. I wanted the part of Gooch, Mame’s Secretary but got the roles of “Irate Macy’s Customer” and “Cousin Fan”. I had so much fun going to rehersals, doing my homework back stage, relishing watching the sets being created and admiring the full-of-life and laughter high school drama teacher who snagged the role of Mame. Just two days ago I was telling Brent about the scene where Mame is riding to the hounds, through the bouganvilla mind you, and we on the stage needed to coordinate our head movements as we “watched” Mame while facing the audience. Oh my, thanks for the memories. Or would that be Mameories?